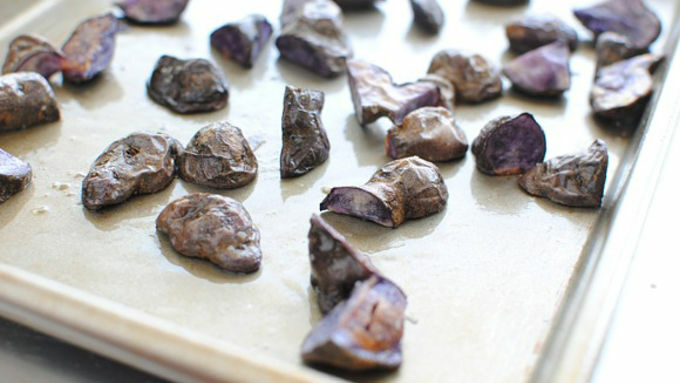 Toss the potatoes with the tablespoon oil and arrange on a baking sheet. Season with salt and pepper and roast for 20 minutes. Roll the pizza crust out on a flat surface. 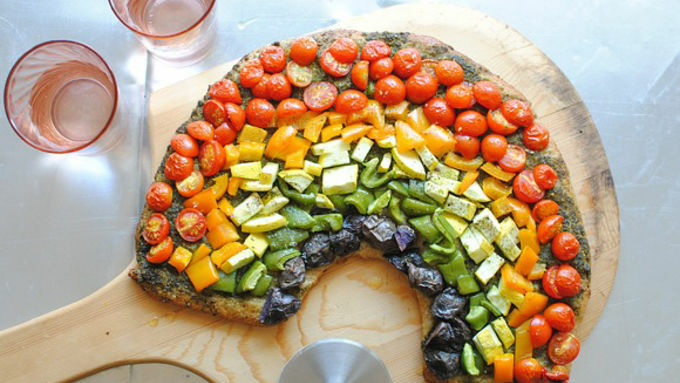 Evenly spoon the pesto over the crust, in the shape of a rainbow. Arrange the vegetables in the order of the colors of a rainbow. The potatoes will go at the bottom, followed by the green diced peppers, then the yellow squash, followed by the orange diced peppers, and finally the halved cherry tomatoes as the very top color. 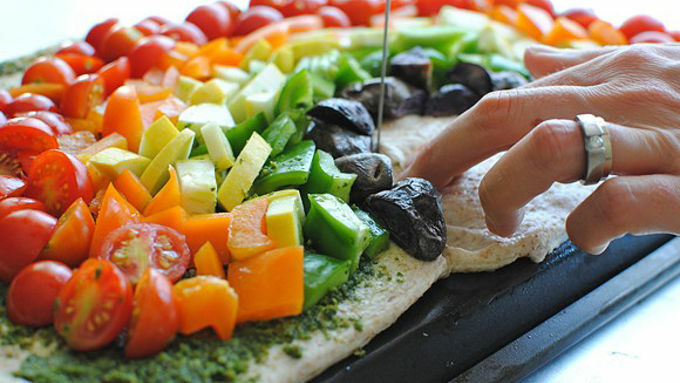 Using a paring knife or pizza cutter, cut away the extra pieces of dough, creating the rainbow shape for the pizza. Season lightly with salt and pepper. Place back in the oven and bake another 20 minutes, until the veggies have softened and the tomatoes wilted. Drizzle with a little more oil and serve immediately. You know you're giggling right now. Is this not the most ridiculous thing you've ever seen in your entire life? You WANT to hate it. You do. But dudes, it's a freaking rainbow. 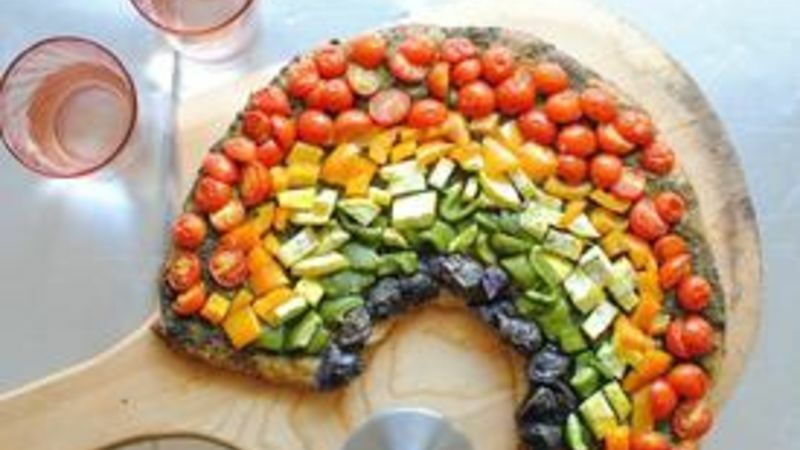 Why again did I make you a rainbow pizza? Oh, let me just lay it out for you: A) Pizza could and should just go ahead and take the place of my blood. B) Vegetables are good and pretty and pretty and good. C) I ran out of unicorn sparkler decorations for muffins. D) IT'S A FREAKING RAINBOW. Aaaand here we go! Grab a Pillsbury Artisan Pizza Crust, some maters, taters, pesto, a yellow squash, a green bell and an orange bell. Bake her up and….rainbow! You're so laughing right now. I want to say "taste the rainbow" but I don't want to get sued and/or dropkicked. Aside from the fact that this is completely hilarious, it's actually REALLY REALLY tasty. You should totally rainbow.